NFL, NFLPA issue joint response to Eric Reid’s drug testing allegation | Bring Your "A" Game Sports Talk! 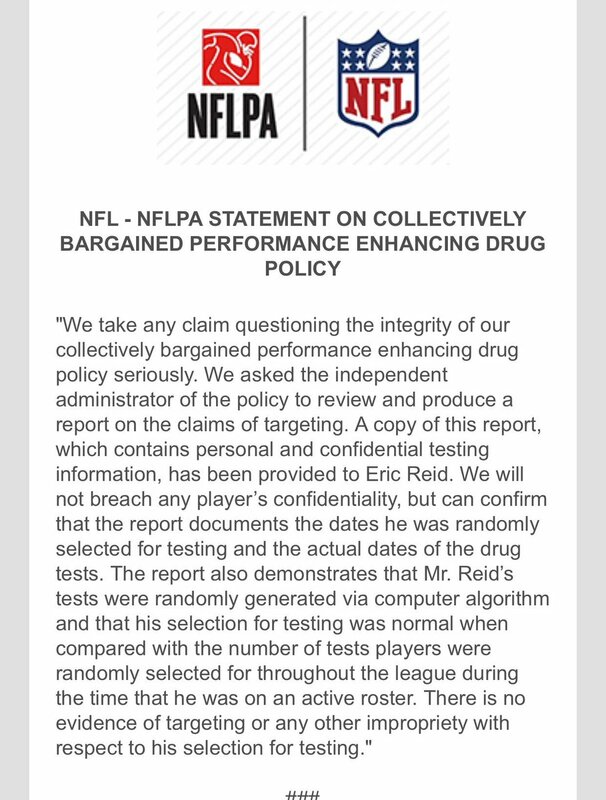 Carolina Panthers safety Eric Reid felt he was targeted by the NFL for random drug testing that was not truly random during the regular season, but it does not appear his complaint is going to get him anywhere. Back in November, Reid revealed that he had been selected for random drug testing for the fifth time since he signed with the Panthers on Sept. 27. That led him to conclude that the system “doesn’t feel very random,” which was basically an accusation that the NFL was trying to railroad him. On Tuesday, the NFL and NFL Players Association released a statement insisting there is no evidence of that.